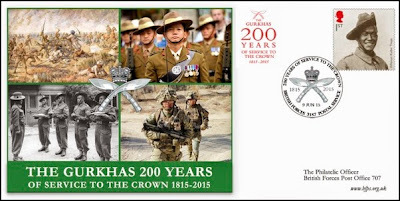 2015 marks the bicentennial of loyal Gurkha service to the British Crown. For the past 200 years, Gurkhas have served with British forces in every major conflict, most notably in the two World Wars where they suffered over 40,000 casualties, gaining renown for their courage and loyalty. Indeed, Gurkha soldiers have accumulated 13 Victoria Crosses for their acts of supreme valour. To commemorate this long and faithful partnership BFPS has produced a special commemorative cover to be released on the 9ᵗʰ June 2015. 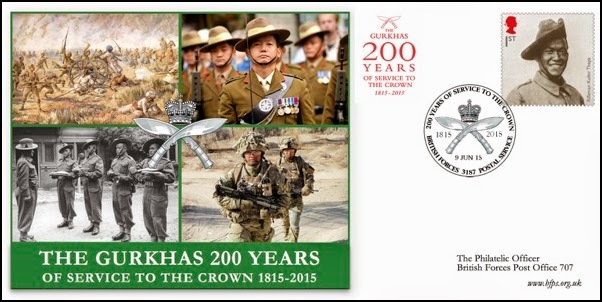 This beautifully designed cover uses images that show the Gurkhas in both their infantry and ceremonial roles. A 1st class postage stamp also bearing the image of a Gurkha soldier (Rifleman Kulbir Thapa VC) will be cancelled by a handstamp specially designed for this occasion. This will be a numbered limited edition of just 200 covers. They will cost £10 each and £6 of this will be donated to the Gurkha Welfare Trust to help them with their vital relief work in Nepal. If all 200 are sold we will be able to donate £1200 to this extremely worthwhile cause. 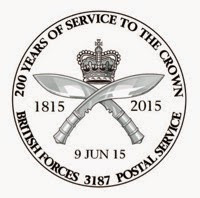 The covers may be purchased from the BFPS online shop (www.bfps.org.uk/shop) from the 9ᵗʰ June 2015. However they are available now to order on a strictly first-come-first-served basis. See the BFPS website for details (www.bfps.org.uk). The covers are also available by post by sending a cheque (payable to ‘BFPS CIC’) to BFPS The Old Post Office Links Place Elie Fife KY9 1AX.